Taylor's revoiced maple guitars have sparked a revival among players thanks to Andy Powers' thoughtful update back in 2015. Going one giant step farther in 2018 with Taylor's innovative V-Class bracing, these refinements deliver much more than the sum of their parts. For everyone from pros to hobbyists, they make the playing experience more expressive, inspiring and fun. From the enhanced volume, sustain and the "in-tune-ness" of the instrument, to the beautifully preserved sonic transparency of maple, the new 614ce Deluxe V-Class guitar delivers a new level of player experience. A torrified spruce top coaxes out a played-in sound with pleasing warmth, complexity and sustain. Gorgeous aesthetic strokes include a hand-rubbed Brown Sugar stain which visually amplifies maple's rich fiddleback figure in a nod to the stains used on traditional violin-family instruments. Taylor also appreciates that maple is a sustainably-managed North American timber, with additional efforts in place to propagate in for future generations of guitar lovers. The 614ce V-Class guitar ships in a Taylor deluxe hardshell case for optimal fit and protection. Body Shape A Taylor original, the Grand Auditorium helped establish the Taylor acoustic sound. The popular body style makes for a versatile guitar that yields ample volume in response to light fingerpicking, and reacts to medium strumming and flatpicking with a clear, balanced sound across the tonal spectrum. If you want a great all-purpose guitar, the GA is an excellent choice. Tonewood Pairing A guitar's top is the primary filter and distributor of vibrating string energy through the guitar, which means it has a huge impact on its sound. Sitka Spruce is the most prevalent guitar top wood of the modern era. It blends stiffness and elasticity in just the right proportions which translates into broad dynamic range with crisp articulation. 600 Series guitars feature a special seasoning process for the spruce top called torrefaction, a method of roasting the wood to produce an aged tonal character with greater acoustic resonance and responsiveness. Traditionally known for having a focused tone with a fast note decay that cuts through a mix, our maple (back and sides) guitars have been voiced to produce greater warmth, complexity, volume, sustain and responsiveness, while retaining maple’s naturally clear, linear qualities. The clarity of the high end is still there, but the bottom end has been extended. The result is a more multi-dimensional sound that gives players the kind of musical versatility of other classic tonewoods, making our maple models a compelling choice as a primary guitar, not just a stage guitar. Our maple guitars are voiced to be very reflective of the player’s technique, so a player with a dynamic playing style or someone who likes to vary their picking attack will appreciate how easily those playing nuances come through in the tonal response. Electronics Taylor's ES2 is a revolutionary pickup design that delivers the latest in Taylor’s ongoing innovation in acoustic guitar amplification. The heart of the Expression System 2 is Taylor’s patented behind-the-saddle pickup, which features three uniquely positioned and individually calibrated pickup sensors. Because the pickup doesn't sit under the saddle, the bottom of the saddle comes in full contact with the bridge, allowing all the nuance of the guitar's tone to come through clearly whether playing acousticly or plugged-in. The location of the sensors enables a more dynamic range of acoustic sound to be captured than ever before while playing plugged-in. Together with Taylor’s custom-designed “professional audio”-grade preamp, this system produces exceptional amplified tone and responsiveness. On stage through a PA, plugged into your favorite acoustic amplifier, or direct into recording software, the Expression System 2 faithfully conveys the voice of your Taylor guitar. The Taylor Expression System 2 operates through a proprietary 9-volt battery compartment and easy-to-use volume, and active bass and treble controls. 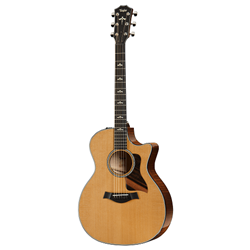 Other Features Taylor's V-Class bracing is a fundamental innovation in acoustic guitar design. It marks an important evolution beyond traditional X-bracing, introducing an entirely new platform for acoustic performance. It is essentially a "sonic engine" that optimizes the response of an acoustic guitar in three key ways: by boosting volume, sustain, and by largely resolving the intonation (in-tune-ness) issues that have long plagued acoustic guitars. V-Class bracing creates purer, more orderly notes that don't cancel each other out or sound "off". They have clearer, more consistent response, and the whole fretboard is brought into greater sonic alignment for a more musical playing/listening experience. Guitars with V-Class bracing are easier to tune; the pitch sounds purer and more solid, and electronic tuners can more easily locate notes for quick, precise tuning. Other benefits: harmonics ring more uniformly down the neck, notes are louder with more projection and sustain, and notes are more consistent, i.e., upper register notes don't get choked out or swallowed. Fewer "sour" sonic qualities exist with chords; a more agreeable relationship is created between notes as they ripen, bloom and decay.